Autopoiesis is an artificial life robotic series of fifteen musical and robotic sculptures that interact with the public and modify their behaviors based on the both the presences of the participants in the exhibition and the communication between each separate sculpture. 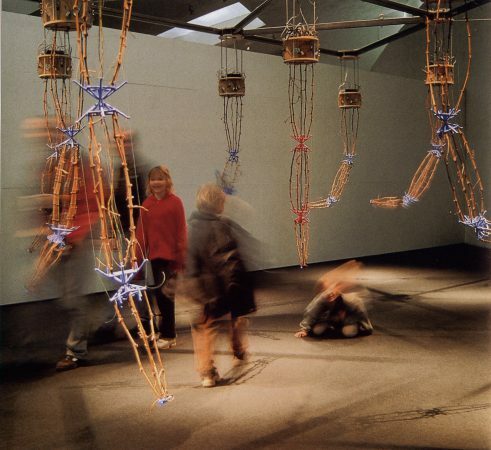 They were commissioned by the Kiasma Museum Finland by curator Erkki Huhtamo for Aoataly Exhibition in 2000. KIASMA MUSEUM OF CONTEMPORARY ART Helsinki, Finland. Feb. 2000 Alien Intelligence Exhibition curated by Erkki Huhtamo. Fifteen Arms of Autopoiesis an artificial life robotic sculpture series commissioned by Kiasma museum. Invited. 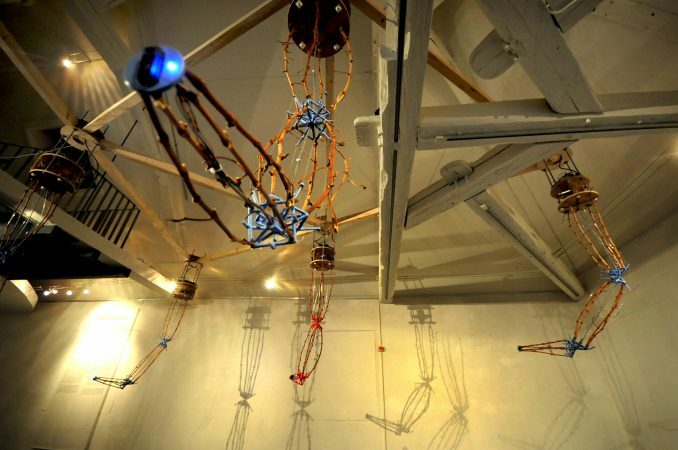 This series of robotic sculptures talk with each other through a hardwired network and audible telephone tones, which is a musical language for the group. Autopoiesis is “self-making”, a characteristic of all living systems. This characteristic of living systems was defined and refined by Francisco Varella and Humberto Maturana. Autopoiesis breaks out of standard interfaces (mouse) and playback methodologies (CRT) and presents an interactive environment, which is immersive, detailed and able to evolve in real-time by utilizing feedback and interaction from audience/participant members. The interactivity engages the viewer/participant who in turn affects the evolution and emergence of the system. This creates a system evolution as well as an overall group sculptural aesthetic.The structures themselves are constructed of cabernet sauvignon grapevines pulled into compression with steel wires. The joints are a custom molded urethane plastic, which is all tied together using cyanoacrylate and baking soda. 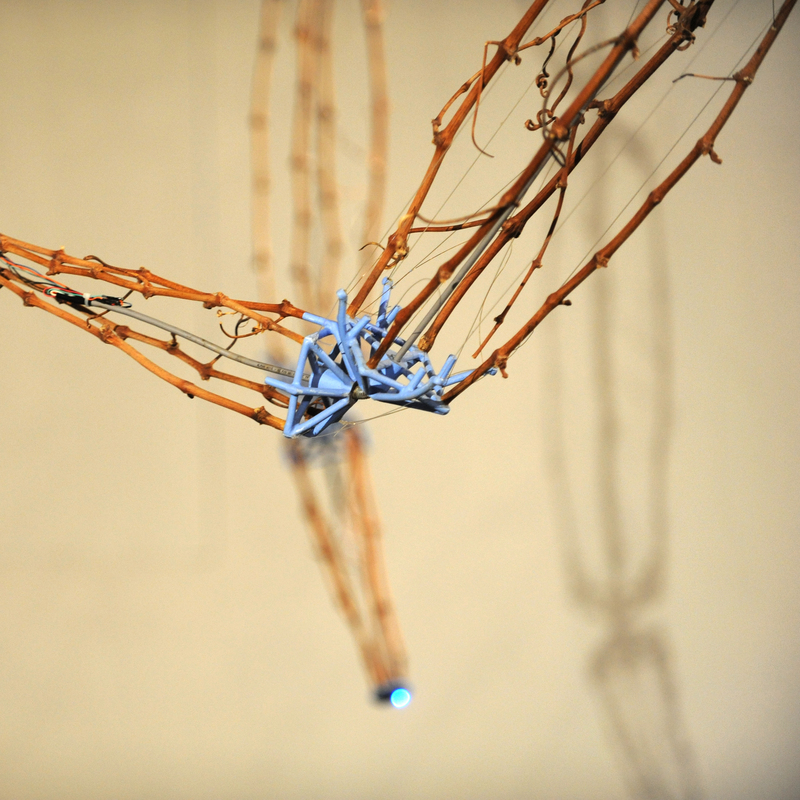 The grapevines were selected to create an approachable natural sculpture that exists in the human biological realm. Autopoiesis utilizes a number of unique approaches to creating this complex and evolving environment. It uses smart sensor organization that senses the presence of the viewer/participant and allows the robotic sculpture to respond intelligently. 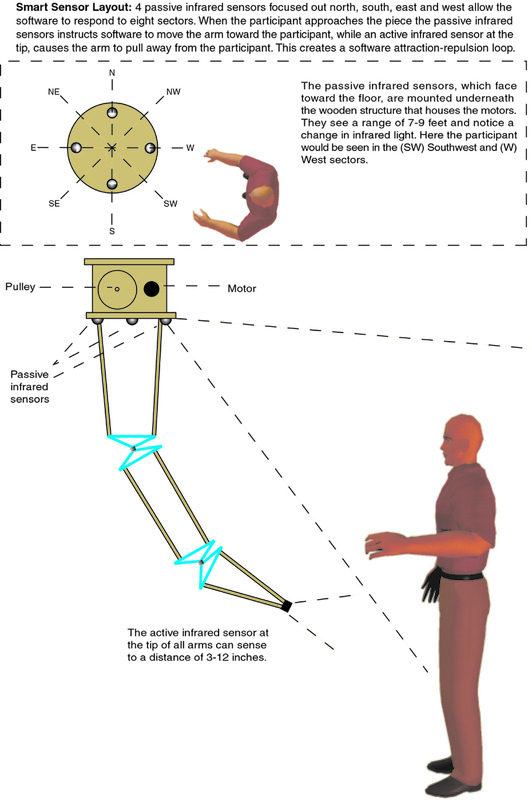 I have used smart sensor organization in past papers to describe the process of organizing the sensors in such a way that they can be minimized in number while maximizing the abilities of the software to cope with the data. 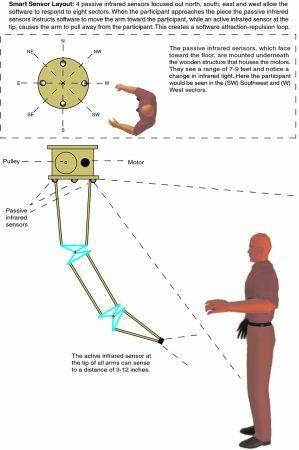 This idea was also explored at the Fourth Neuromorphic Engineering workshop at the Telluride Summer Research Center where participants noted that just a few sensors can be used to create complex interaction if the sensors are properly organized. Autopoiesis as part of the VIDA winners retrospective invited by Karin Ohlenschlager. Alien Intelligence Exhibition curated by Erkki Huhtamo. Fifteen Arms of an artificial life robotic sculpture series commissioned by Kiasma museum. Invited. ARCO ARTS FESTIVAL Madrid, Spain. Autopoiesis installation sponsored by Fundacion Telephonic for VIDA 3.0. AUSTRALIAN CENTER FOR PHOTOGRAPHY Sydney, Australia. Oct. 2000 curated by Leah Grycewicz.Displayed installation sponsor dlux Media Arts. CENTER FOR THE ARTS, RUTGERS UNIVERSITY Camden New, Jersey. 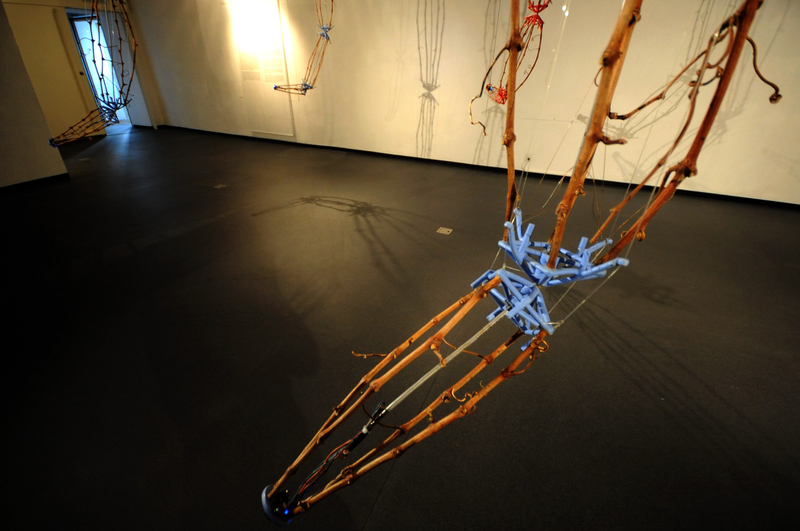 Autopoiesis, as part of an exhibit on robotic art curated by Richard Castelli. Invited. TWEED MUSEUM OF ART, UNIVERSITY OF MINNESOTA, Duluth Minnesota. Nov. 4th 2003-Jan 4th 2004Contemporary Art and Mathematical instinct Curated by Peter Spooner one arm of Autopoiesis. Invited. Curated by Richard Castelli. 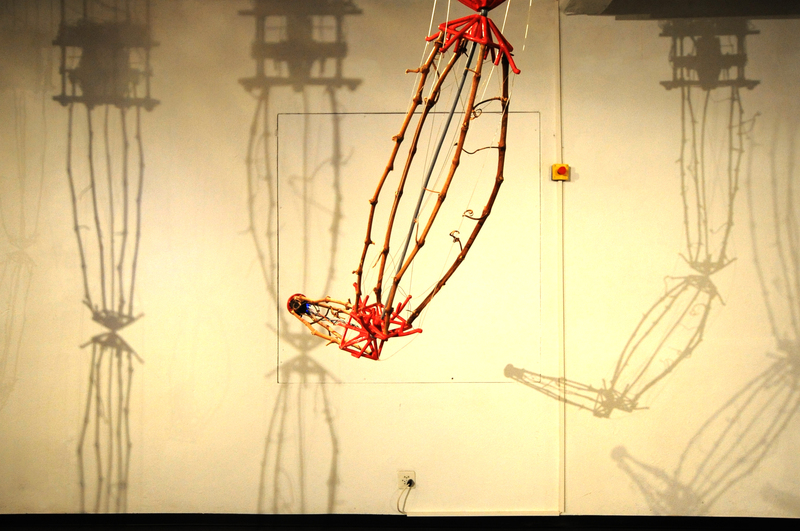 Displayed Autopoiesis, interactive robotic installation of 10 works with video installation. Invited. Immersion Exhibition curated by Chris Malcolm and Paul Thomas. Displayed 10 arms of Autopoiesis. Sentient Circuitry Exhibition curated by Melanie Townsend. DisplayedAutopoiesis and 1 Cybersqueek. Invited. 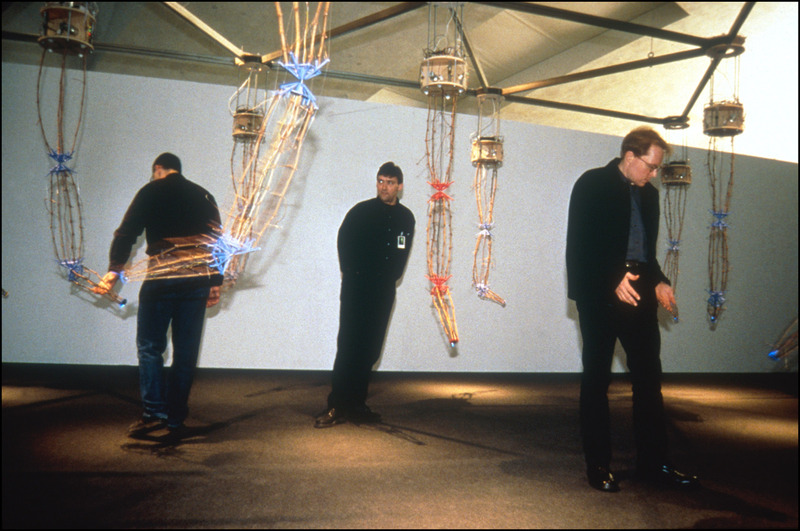 Cyber Arts 2001 Exhibition. Juried. Displayed 10 arms of Autopoiesis with new video installation work coupled to the main installation. Honorary mention in the Interactive Art category, International Compendium Prix Ars Electronica. New Works Faculty Exhibition. Displayed two arms of Autopoiesis. Alien Intelligence Exhibition curated by Erkki Huhtamo. Fifteen Arms of Autopoiesis an artificial life robotic sculpture series commissioned by Kiasma museum. Invited. The brains and microcontroller within Autopoiesis are custom embedded microcontrollers. 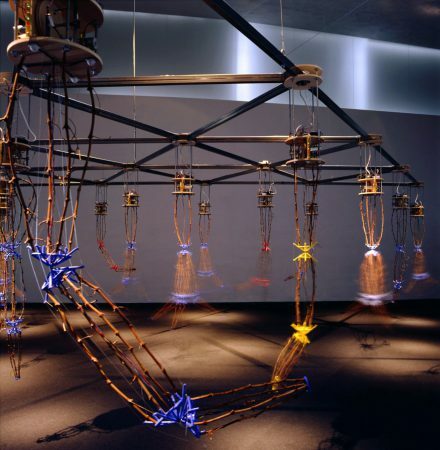 Custom cast urethane joints with a pull string mechanical system developed by Rinaldo and allowed the use of cyano acylate and baking soda to create these interactive works. Full-size room 30 x 30 feet, with no intervening sound or projections. AC 115-220 HZ. The grapevines have been completely fumigated under pressure and can be shipped internationally. 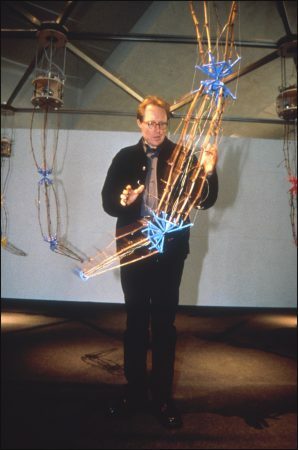 Aoataly, Alien Intelligence, edited by Erkki Huhtamo, 2000. Sentient Circuitry Banff, Machines and Humans interact in Sentient Circuitry, 2002. Context Providers, Editors are V Vesna, M Lovejoy, and C Paul, published by Minnesota Press. Pg Reproduction of Autopoiesis. Open System, Rethinking Art in the 1960s and 1970s, Edited by Donna De Salvo Tate Publishing, Publication May 2005 Autopoiesis illustrated in the context of an article by J.D Conner. 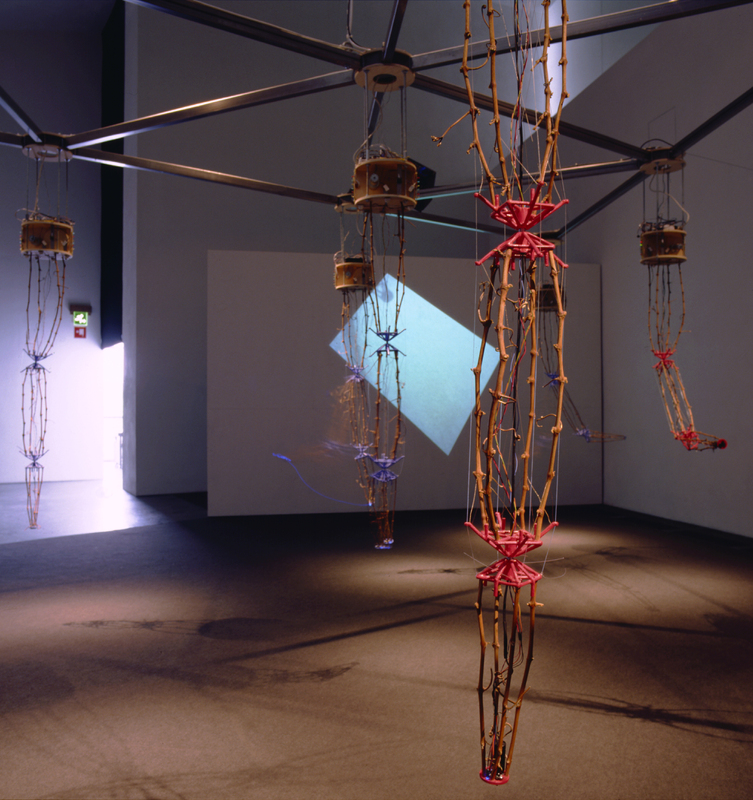 Digital Art by Christiane Paul, curator New Media Arts Whitney Museum by Thames and Hudson Spring 2003. Book for the electronic arts by Arjen Mulder and Maaike Post, Holland, 2000. Enventara El Futuro: Arte Electicicidad Nuevos Medios by Edward A Shanken, Autopoiesis page 86. Vue Weekly Magazine, “Cybernetic Ballet of Ken Rinaldo’s Autopoiesis” at the works by Mary Christa O’Keefe. Terra GUM TV interview about Autopoiesis as part of Transmediale 02 Berlin. Sat 1TV & Radio Germany, interview about Autopoiesis as part of Transmediale 02 Berlin. National Public Radio, coverage of Autopoiesis as part of Intersculpt Biennale, Dayton Ohio, 2002. Japan Broadcasting Corporation, Channel 1, interview about Autopoiesis as part of Ars Electronica, 2001. Telivixija Slovenia TV and Radio interview about Autopoiesis as part of Ars Electronica. Treffpunkt, Kultur, Channel 2, Austria, 2001. CyberBang TV, Program on Digital Art, Italy, 2001. ORF, Austrian Broadcasting Corporation footage of Autopoiesis, 2001. Caiga Quien TV, Caiga Spain, coverage of ARCO Spain Installation, 2001. Canal Plus TV, coverage of ARCO Spain Installation, 2001. Menudo Magazine TV. Channel 3 Italian TV, 2001. CNN Europe coverage of ARCO Spain Installation, 2001. TV2 Spain; La Noticias Cadina TVE Spain, 2001. VIA Digital coverage of ARCO Spain Installation, 2001. Channel 1 Sweden TV Reviews of Autopoiesis at the Kiasma Museum in Finland, Feb. 2000.